The author at the Ace Café’s US location. My buddy Wes asked me to write up a short article for you folks based on my vast, extensive experience with motorcycles. By vast, extensive experience, I mean the three weeks I had ridden as of the time I wrote this. I blew up (don’t ask) my MINI Cooper and had been looking around to replace it was something that was small, light and good on gas again, and started thinking that maybe a little scooter would be fine for commuting the nine miles and back to work. As I started to look into those I realized that the price of a scooter gets you almost all the way into the price of a motorcycle, so I started thinking maybe I need to be a motorcycle owner for the first time in my life. The problem was, I didn’t know anything about motorcycles and the idea of even riding around without a seat belt seemed terrifying to me. I did what every red-blooded American male does. I got on YouTube and started watching videos about how to ride a motorcycle. I bet you’ve seen some of the same ones I saw. Some of them were terrible, and some of them were actually very good with experienced riders taking time to show exactly what is involved in even the basics, like starting a bike and just moving slowly around the parking lot. I started to get the idea that maybe I could do this. I started listening to motorcycle podcasts and following popular YouTubers and bugging my buddy Wes about everything I could think of. He’s been a BMW guy for as long as I can remember him riding, so I’m naturally attracted to the precision engineering and beautiful lines of Motorrad’s offerings. Plus I already had experience with BMW from my MINI. I watched Long Way Round, Long Way Down, watched Charlie Boorman’s Dakar Rally movie, and started learning everything I could about motorcycles in general. I bought a copy of Precision Motorcycling by David Hough for three dollars online at a Goodwill, and started reading through that and realized that there’s a lot more to motorcycling then hitting the gas. Several of my coworkers ride, and when I brought up this topic they immediately told me I needed to take the MSF class before they would even discuss it with me. I used some Christmas money to sign up for the class and took it two rainy weekdays in early January. Man, it was pouring rain for that class but maybe that’s a good thing. I’m not afraid of the rain now, that’s for sure, and Florida gets more rain then anyone in the US except Washington state. The BRC is the ultimate learning-to-ride equalizer. Over the protestations of my friends, I decided I wanted to start on a very small displacement motorcycle since the class basically qualified me to drive around in a parking lot. That’s not a bad reflection on the class, it does a great job of teaching you everything you need to know about a motorcycle from the beginning. Before I went to the class I didn’t know how to start one, I didn’t know how to shift, I didn’t know how the clutch responded, I didn’t know a friction zone from a freak show. The class was an excellent beginning introduction in confidence builder. You did a good job of warning you of the dangers enough so that you can take them seriously when you do get out on the road. But honestly nothing is a substitute for actual traffic experience. I think it would have been foolish to leave that class and go out and buy a 1000cc bike. 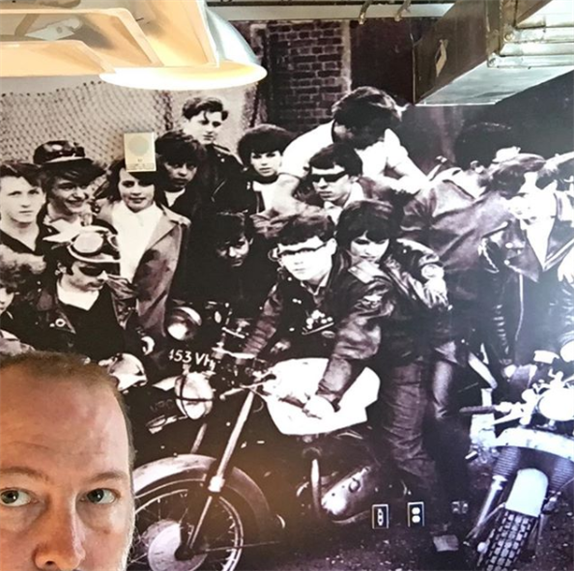 A funny thing happens when you tell your friends you’re shopping for a motorcycle – they start shopping vicariously through you. I had guys recommending 1200cc Harleys, an FZ9, and all kinds of crazy stuff that I really don’t think would be appropriate for someone who had never driven over 20 miles an hour in second gear. 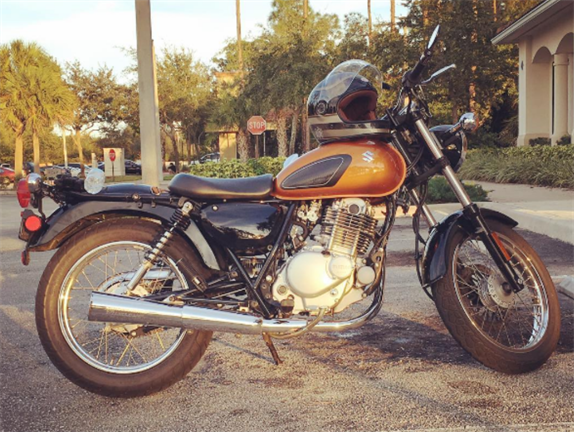 I ended up settling on a 250 Suzuki – the exact same bike I was using in the class – and had a good time driving around town, gently staying out of peoples’ way and watching out for left-turners of all types. I’ve owned it right at two weeks now and have about 250 miles under my belt right now, less than one percent of most of the people I know who ride bikes. But I’m going on an adventure! 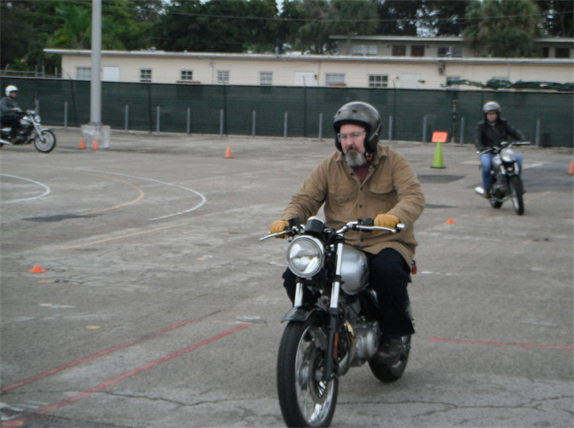 I would recommend the MSF class to anyone who wants to know How a motorcycle works and has never sat on one before, or even to the experienced rider who just wants a refresher and a fun chance to drive around the parking lot around the cones. Some of the best money I’ve ever spent, I figure. Scott’s first bike, a Suzuki TU-250. The class itself was an eye-opening experience. There were eight students – two 40-somethings (of which I was one), two 30-somethings (who were cops getting their endorsements because they were applying to be motormen for the City of Sunrise Police Department) and four early-20-somethings who all just liked motorcycles or scooters and wanted to learn. It was refreshing to see so many young people wanting to learn to ride. I have been told that motorcycling is dying out, but based on the demographics in my class, that isn’t the case. Millennials are (generally speaking) interested in experiences, and motorcycling provides that. The first 30 minutes or so was paperwork – signing releases, filling out forms, etc. We went around the room and introduced ourselves and told why we wanted to learn, which was cool. Then, out to the bikes. We picked up helmets and struggled to figure out how to operate those D-rings in the blind, then walked over to a row of Suzukis and picked one out for ourselves. They were all identical so it really didn’t matter, other than there were two 250cc cruiser-type bikes from Kawasaki, which went to the girls. Oh, did I mention there were a couple of ladies in the 20-something group? Finally, we got on the bikes, put kickstands up and started walking the bikes in neutral around the parking lot. This gave us a feel for the weight of the bikes, and got us familiar with the front brake’s response. It was a big moment when we all got to start the bikes up, what a great sound. We sat there revving our 250cc engines like little kids, grinning like goofballs. SO COOL! Preview for Scott’s YouTube channel, AmenMoto Motorcycle Adventures. Then it was time to concentrate – we put the bikes in first gear and got to know the friction zone. We just rolled the bike a foot or two forward, then braked, keeping both feet on the ground. This went on for a good five minutes or so, then it was time to get the bikes rolling, still in first gear, and we went back and forth across the parking lot in straight lines. It was a cool feeling when we finally got both feet up on the pegs. 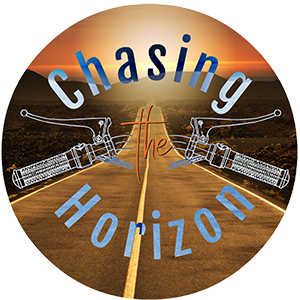 I know this sounds almost ridiculous to a seasoned rider, but that was the moment it really felt like we were learning to ride motorcycles – when we had both feet planted and let the bike go fast enough for gyroscopic action to keep the bike upright. What followed is a little bit of a blur. We would get off the bikes, walk over and talk to the teacher (or “rider coach”), discussing what we learned and what we felt, then we would go back out ot the bikes, start them up, ride around the course accomplishing some other small task, then bikes parked, discuss again. The constant parking and starting and parking and starting was ingraining the process of turning off the bike and parking it safely and then starting it up again. We didn’t know this, we just thought it was all fun. 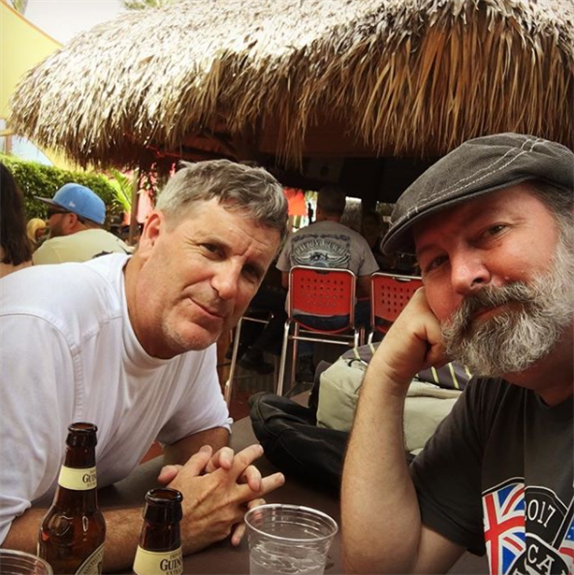 The AmenMoto duo, Doug (L) and Scott. After a break for lunch, we returned to the riding range for a series of increasingly complicated tasks, like the double-U-turn box, learning how to coordinate both brakes, weaving through small cones, handling a mid-turn stop, learning how to upshift and downshift (and what downshifting does to traction,) and ended the day with a discussion and a video and opted to take our written tests, since if anyone failed they could take it again the following day. Two folks got perfect scores, the rest of us each missed one question. A passing grade for everyone on the written test, it was nice to have that out of the way. We were invited to come back early the next morning, so I arrived at 6:30 and did some laps and some cones and the double-U-turn box a few times. Then the class started up with more complicated driving tasks. The rain was absolutely POURING by this point, and the instructor gave us about a 30-minute break to wait for a break in the rain, which never came. We all agreed we would skip the lunch break and try to power through the rest of the course without any breaks. We were all completely soaked all the way down to our skivvies, and it was chilly, but we powered on. By noon it was time to start our testing. There were something like 10 or 12 tasks we had to complete, some of which were done two-tests-at-a-time. For example, “Demonstrate you can drive a half circle staying in your lane, then come to a stop within this box.” Each person did their task while the rest of the class watched, then we all moved on to the next task. When the tasks were over, we parked the bikes by the shed, helped fill them back up with gas, and put them away. My trip-meter said 11 miles total for the two days of class. Finally, we were all done and we went back inside, wondering how we did. In the classroom, the rider coach let us all know we had all passed, and after a collective sigh of relief he told us each how we did and where we had a point or two deducted. No one was anywhere near close to failing. With a round of applause for ourselves, we packed up and headed home – or, some of us to the DMV, where our test results had already been transmitted – to get our license endorsements. 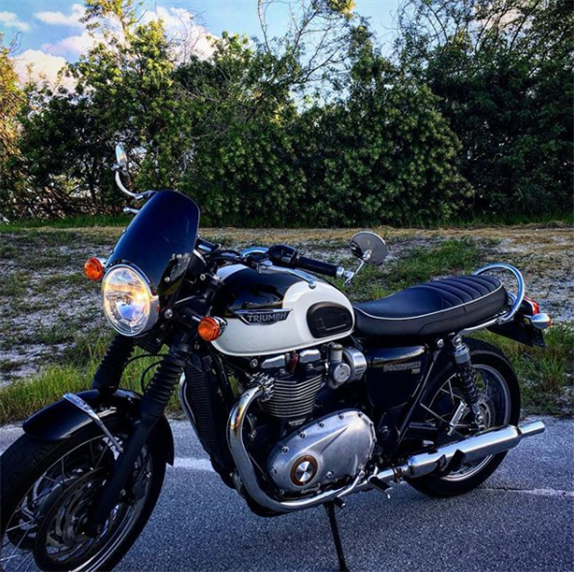 Scott rode that little Suzuki for a year, after which he traded it in on a barely used Triumph Bonneville, pictured above. He still hasn’t bought another car and rides everywhere he goes, having recently ridden his 20,000th mile in his two years of motorcycle ownership. You can see his collection of motorcycling videos by searching for AmenMoto Motorcycle Adventures on YouTube. He even rides his Triumph off-road, as the video below shows!